Wash, quarter and stone the plums. Place in a saucepan with the plum stones, spices and 400ml water. Cover and bring up to the boil, then simmer gently until the fruit has disintegrated into a soft mush. Tip into a jelly bag and leave to drip over a bowl for a minimum of 12 hours. Discard the pulp. Measure the resulting juice. 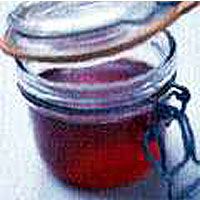 Allow 450g sugar with pectin for every 450ml plum juice. Put the juice and sugar in a jam pan and set over a low heat. Stir occasionally until the sugar has melted, then increase the heat and boil rapidly for a minute or until setting point has been reached. Skim off any scum and pour into jam jars which you have sterilised (either by washing in soapy water, rinsing and drying in a very low oven or washing in the dishwasher and allowing to steam-dry). Cover and label once cool. The jelly will last for a year.